How to Survive Family Court: Strategies to Win is a nonfiction legal self-help book written by Jessica Stark. Divorce can be a life-altering, grueling and expensive process, especially when there are kids involved. Knowing what to expect going into the process and how to get the best possible lawyer for your specific situation can make a tremendous difference. Stark is the survivor of a divorce process that left her emotionally and financially drained. She learned a lot through her navigation of the Family Court maze and shares her experiences and wisdom in this guide. She walks the reader through the legal jargon with her glossary of terms and presents a walk-through of the entire divorce process. Then she prepares the reader for the all-important selection of an attorney, including pointers on keeping a proactive control on the hidden expenses, such as document copying and phone calls, associated with legal representation. She continues by describing what it’s like going to court, what to expect when meeting your parenting evaluator or guardian ad litem -- and the difference between the two. Stark takes the reader through every step in the divorce process, all the way to the Settlement Conference and trial, if necessary, and beyond. Jessica Stark’s nonfiction self-help book, How to Survive Family Court: Strategies to Win, is not written by a lawyer, and that’s a very good thing. A lawyer would have hidden the valuable and concisely presented details given here within a nest of legalese and hypotheticals. Coming from a legal background, I’m unfortunately familiar with those kinds of books and found Stark’s book to be a glowing testament to what a legal self-help book should be. I loved seeing how she guides her readers to the perfect lawyer and found her chapter on the divorce “Roadmap” to be superior to anything else I’ve read on the topic. Stark has been there, and she gets it. Her book is written in an accessible, conversational style, and her material is organized with an eye to being there for the reader throughout every step of the divorce process. I couldn’t think of a better mentor and guide for someone who’s considering a divorce than Jessica Stark. How to Survive Family Court: Strategies to Win is most highly recommended. How to Survive Family Court: Strategies to Win by Jessica Stark is a self help book that guides the reader through the often confusing and heightened emotions that come with divorce and family court. Stark creates a comprehensive guide based on her own experiences. With each chapter she details ways that will help the reader through crucial things like selecting the right lawyer, creating an action plan, how to gather information for the courts, and -- most importantly -- how to talk to your child during this often emotionally tense period. Drawing on her own life and experience in the courts, Stark guides the reader expertly through the whole process, highlighting resources and tips, all geared toward empowering the reader. She also shares a list of what NOT to do, things that may make it harder for you in the eyes of the court. With an emphasis on documenting everything, How to Survive Family Court: Strategies to Win by Jessica Stark is a well written and informative text. It is written in a way that makes for easy consumption and provides a great range of insights for people, whether they are considering divorce but are unsure what comes next, or are in the midst of the divorce process itself and are looking for real information that lawyers often won’t mention. In an exhaustive text, Stark leaves no stone unturned with How to Survive Family Court as she seeks to empower those going through the emotionally fraught terrain of divorce. How to Survive Family Court: Strategies to Win is a helpful legal advice guide written by author Jessica Stark. Stark’s real life experiences in the family court system are translated here into a successful step by step lesson programme that anyone having court difficulties can follow. Written for those at all stages of the divorce and custody period, Stark provides the know-how and skills that an individual requires to work alongside their lawyer and win a successful bid in the courtroom. Though the book is short, it covers many topics including lawyer selection, presentation of the case, as well as personal topics like helping your children through the court process. Jessica Stark writes as a woman on a mission, ready to equip others with the skills they need to seek justice when divorce rears its ugly head. In How to Survive Family Court: Strategies to Win, Stark has produced a very practical and truthful guide that I’m certain will uncover the painful truth about how difficult and confusing family court proceedings will be for first-timers, which will really help those just starting the process. My only criticism is that the volume could be longer, offering a little more depth into the actual proceedings and paperwork required. On an emotional level, however, Stark really hits home with the truth of how you need to be a dependable, strong, directed and independent person to win at court, and I really appreciated her desire to stop parents relying on lawyers when their child is relying on them. 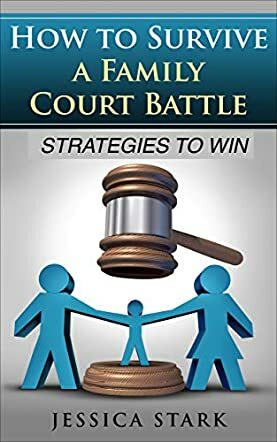 How to Survive Family Court: Strategies to Win has the potential to save the reader tens of thousands of dollars, months of exacerbated stress, and children from a judge’s parenting decision that could prove not to be in their best interests. Jessica Stark has written the book in the light of her own prolonged and distressing experience, and it contains how-to advice on selecting a lawyer, working with a parent evaluator or a Guardian En Litem and explains the difference between them, gathering information for the court, creating a case road map, and talking to the child/children. In brief, how to survive divorce proceedings. Is reconciliation possible; with divorce, there are NO WINNERS. Spouses suffering mental or physical abuse are excluded; they MUST walk away, and a support link is provided. Divorce is never easy, but if a couple has children, young lives, not who gets to keep the CDs, are at stake. Parents wanting custody or visitation rights will use anything to fight the other and the road map – a chart showing when “what next” is supposed to happen and where – is designed to keep track, but also to maintain sanity. The road from filing papers, or responding, to resolution is long and hard, and how a parent behaves can influence the result. Is dating when you’re divorcing okay? How do you prove when the relationship began and that you weren’t cheating? Have you thought beyond your babies or toddlers to their teenage years? Jessica Stark’s How to Survive Family Court: Strategies to Win is a must-read for every parent approaching divorce. Are you about to file for divorce or custody of your children? Don't leave anything to chance! Learn how to get your ducks in a row before filing in the informative self-help book, How To Survive In Family Court (Strategies To Win) by Jessica Stark. Discover how to hire the best lawyer for your case and your family, prepare emotionally and physically for the subsequent proceedings, and what will be expected of you in the next steps. With advice on all things lawyer and court-related, down to how to conduct meetings with Child Services, this book is full of helpful information aimed at saving you money, time, and wasted effort. Learn how to best conduct yourself at court and with officials, how to dress appropriately for the proceedings, and the pros and cons of going to trial. Be prepared for the fight of your life, and go into battle with all the tools and resources at your disposal. How To Survive In Family Court (Strategies To Win) by Jessica Stark is an essential book for the newly single parent; full of advice, tips, tricks, and real-life examples of what to do and not do during a divorce or custody battle. I loved the author's down to earth honesty and the simplicity with which she spoke. Her advice was clear, concise, and enlightening. I appreciated the way the author used her own experiences in her divorce and later custody proceedings to help clarify her points. This book is amazingly enlightening! I really enjoyed reading it. I would recommend this book to those that are thinking about a divorce or in the midst of a family court battle.